Starring: Erica Linz, Igor Zaripov, Lutz Halbhubner and more. 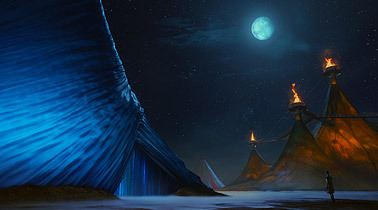 Synopsis: From the big top to the big screen, visionary filmmaker James Cameron and director Andrew Adamson (Shrek, Narnia) invite you and your family on an all new 3D adventure: Cirque du Soleil Worlds Away. 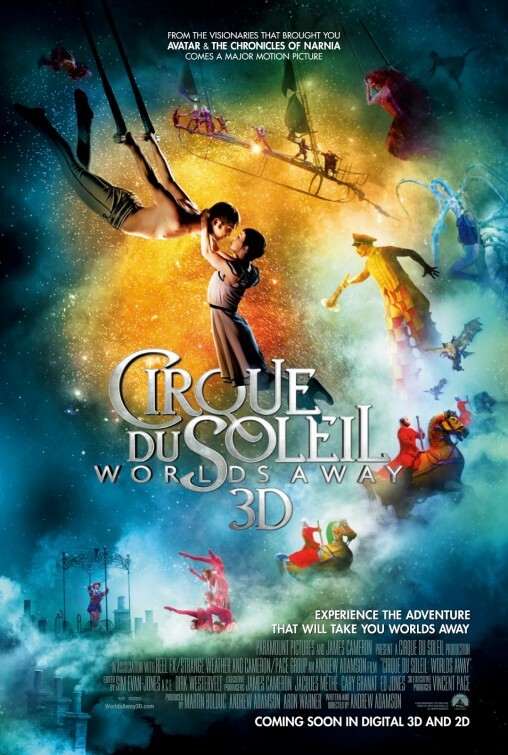 A young couple who is separated, must journey through the astonishing and dreamlike worlds of Cirque du Soleil to find each other, as audiences experience the immersive 3D technology that will allow them to leap, soar, swim, and dance with the performers. This Holiday Season, Cirque du Soleil brings their world to your city! Rated: Rated PG for mild sensuality and dramatic imagery. Cirque du Soleil: Worlds Away is a colorful story full of wonder, amazing performances and sets that are both inventive and imaginative. This visual presentation places the viewer in a front row seat to the action on stage as the story of a young woman visiting a circus unfolds. When she finds herself entranced by an aerialist, both of them fall in love and into an amazing dreamworld that separates them. The near-wordless adventure through a world reminiscent of Alice’s “Wonderland” follows their bizarre and beautiful quest to find one another again. The strength of this film lies not in its most basic of stories, but in the presentation of it. It plays out much like a live performance on stage as opposed to an actual “movie” if you will. A visually gorgeous treat that thrills the eyes, ears and hearts of those in attendance. With acrobatic feats full of fluid motions and moments that cause you to hold your breath and want to applause with the subsequent sigh of relief and gasp of amazement, Cirque du Soleil: Worlds Away impressively delights. From underwater synchronized dances to high-flying daredevils, to colorful worlds painted on a canvas of bright imagination, to mind-blowing contortionists, to the slow-motion capture of feats that simply are beyond belief, this “Vegas-to-You” performance brings an eclectic smorgasboard of characters, music and physical art in a fashion that is not to be missed on the big screen and in 3D (sans the opportunity of seeing such an act live). What it lacks in story it more than makes up for in the telling of. 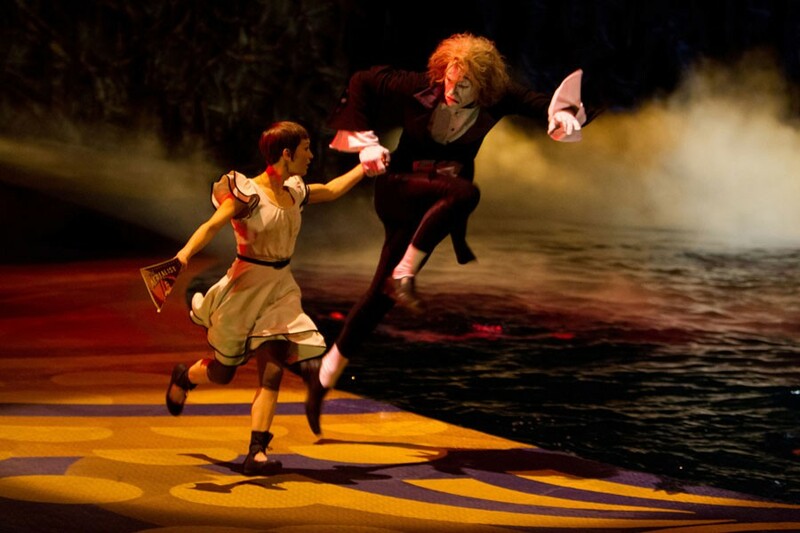 A fantastic experience of wonder, imagination, beauty, love and the circus. Check it out while it is in theaters as it undoubtedly will not carry the same charm on smaller screens. Transport yourself to a “world away” and enjoy this beautiful presentation that may have you applauding at the end! Nice one T. I actually seen Cirque de soliel on stage years ago and this sounds quite appealing to me. Doesn’t harm it’s chances when Cameron is involved either. Cheers man! Mark, thanks for stopping by and reading. I think it’s interesting that James Cameron s such a 3d fan. I liked how he immersed us into the world of Cirque du Soleil. Beautiful.